Law Enforcement, EMT/EMS/Fire, and 911 Dispatchers. Valid form of identification must be present at time of check-in. 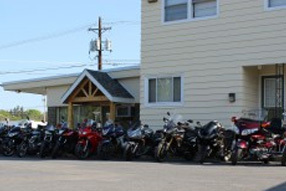 If you are looking to make Canyon Motel your home for 5 or more nights, please contact us about our discounted rates. Book 5 or more rooms and get a FREE night for the bride and groom. Call us to reserve at 570-724-1681. Attention Classic Cars and Bikers! Need 5 or more rooms? Please contact our friendly front desk staff for special rates. We are here to make your group feel at home. Whether you are having a girls weekend getaway to shop downtown or want a quiet night away, Canyon Motel is the perfect place to stay. Please call our friendly front desk staff and ask for our special rates.